Free open bar stocked with beer, wine, soft drinks and water. New: free Wifi on our vessels. The 'Spirit of Malta', the largest sailing catamaran departs from Sliema at 10.00am. Built for cruising, it's the best way to enjoy a relaxing day at sea, sailing to the most scenic bays in Malta, Gozo and Comino. We do not have a fixed programme, we sail according to prevailing weather conditions. 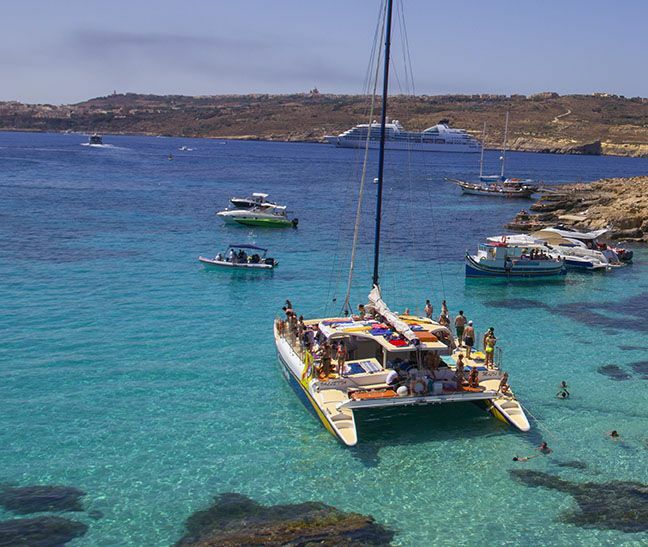 We stop for swimming in different bays and visit the famous Blue Lagoon in Comino (weather permitting). A buffet lunch is served during one of our swimming stops. Our well stocked Free Bar on board provides beer, minerals, wine and water throughout the day. After lunch, the party begins! Music and dancing to top hits and groovy rhythms. Learn a new dance, get a tan, make new friends or just have the time of your life! There are toilet and shower facilities on board. The Spirit of Malta Sailing Cruise is 'A Cruise with a Difference.' It is an ideal way to spoil yourself for a whole day. Book early to avoid disappointment. You will return to Sliema at approximately 6.00pm.